Learn in this article which laws you need to follow in Mauritius if you want to fly there with a drone. Maximum altitude: The maximum height allowed in Mauritius is 120 meters (400 feet). Maximum horizontal distance and FPV: No data available. Compulsory insurance: In Mauritius, you need aviation liability insurance. Maximum take-off weight (MTOW): For private flights, there is a weight limit of seven kilograms. Distance to airports: No data available. Other safety distances: A distance of 150 meters must be maintained for populated areas and crowds of people (500 or more). Individual persons, vehicles, ships and other obstacles have a safety distance of 50 meters. During take-offs and landings, this distance may be shortened to 30 meters. Operating hours: Individuals are not allowed to fly at night with their multicopters. Requirements for commercial pilots: The commercial use of multicopters requires the approval of the aviation authority. To obtain the Permission for Aerial Work (PFAW), you must be at least 18 years old, demonstrate theoretical knowledge, and demonstrate your practical skills. Besides, you must submit an Operations Manual, in which you explain the various flight procedures. A template is available on the website of the Department of Civil Aviation (DCA). For the grant of the PFAW you will be charged 10,000 MUR (about 260 euros). The permit is valid for three years. Under certain circumstances, temporary licenses for foreign drone controllers may also be granted. 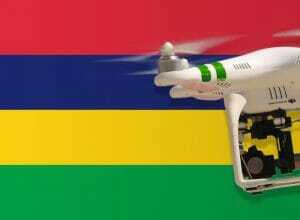 We have researched the listed drone regulations for Mauritius to the best of our knowledge. We cannot guarantee the correctness of the information. If you want to be on the safe side, contact the competent aviation authority. Alternatively, you can also ask the embassy in your country for further information about the regulations. Please leave us a comment when you receive news and/or gain experience with your copter in Mauritius!